The British Empire, suddenly finding itself with an interdimensional portal due to a Weird Science experiment gone awry, has discovered a new world, the Gruv, chock-full of resources and land to be exploited. In the process, though, they've run headlong into the Samsut, descendants of ancient Babylonians who've been living there for over three thousand years. Now, the might of the Empire clashes with the weird science of the Samsut. The Saurids, a reptilian race native to the new world, contest with both empires to retain their ancestral lands. Who will control the Gruv? Meanwhile, first in London and then around the world, magic has returned. In some cases, humans have changed, becoming elves, dwarves, snarks, and trolls. In others, mages, priests, and shamans have gained awe-inspiring powers. Weird Scientists build unexplainable devices. Technological leaps forward have given us British microsteam engines, Confederate Giffard airships, and Prussian lightning guns, with new world-changing inventions appearing every day. Dodgers skulk in the shadows, doing what reputable firms need to be able to deny. The British hold title to the Rabbit Hole and its access to the Gruv, but other nations have brought pressure to bear, and will not be denied their chance at the riches of the new world. Intrigue! Exploration! Giant insects! Battery-powered zombies! War in the New World and the threat of it in the Old! Where will all this end? That's for you to decide! 1879 is a roleplaying game set in the late Victorian era of an alternate history, with low-level magic, high-level adventure, and vast possibilities as the Age of Steam gives way to the Age of Electricity. 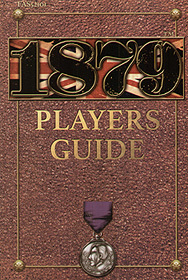 The 1879 Players Guide provides everything needed to play the game for characters in the Initiate, Novice, and Journeyman Tiers of advancement, from character generation to combat and from obscure magic to the latest in Victorian technology. An overview of the game world is included for player reference, along with multiple short fiction examples of the sorts of stories that can be told!